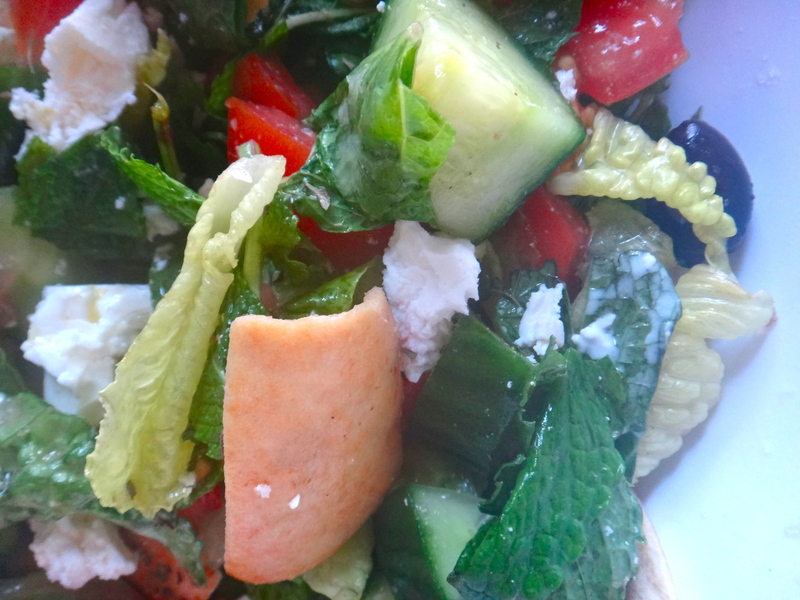 Salads get a bad rep as a main course because oftentimes what we picture as a stereotypical salad are just the saddest little leaves of iceberg lettuce with some grainy tomatoes, limp cucumber and dry shreds of carrots strewn over top. When people say they don’t like salads though I believe they just haven’t found the salad for them yet. 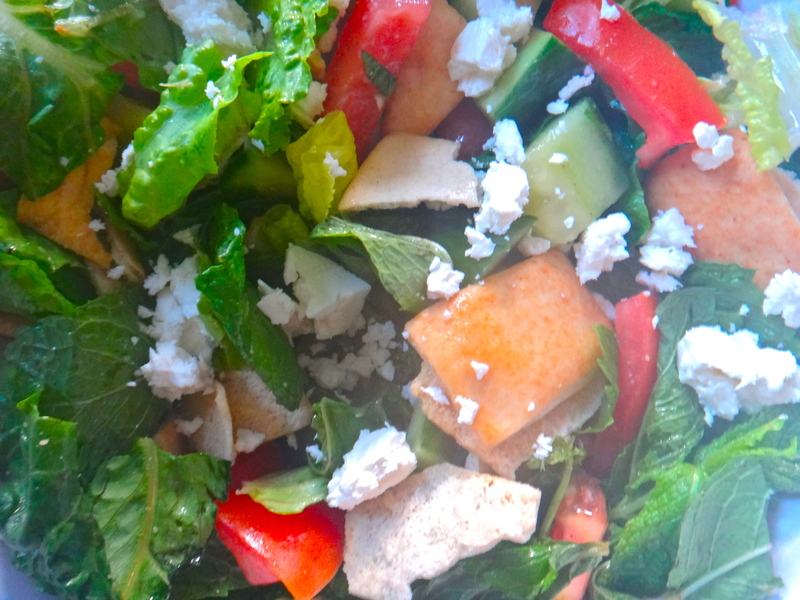 There’s a salad out there you’ll like. From Thai som tam papaya salad with peanuts and shrimp to warm spinach salads with bacon, mushrooms and a poached egg. Jean George’s carrot and avocado salad is a must order at his restaurant ((or must make at home) and the pomegranate seeds on Joy the Baker’s apple and brussel sprouts salad really make the whole dish. Anyways. 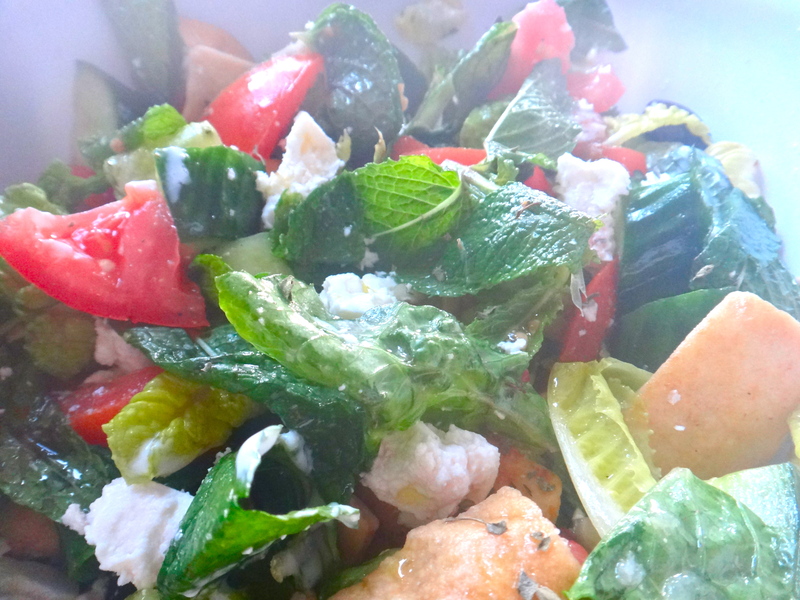 Lately my favorite salads have been more Mediterranean leaning. 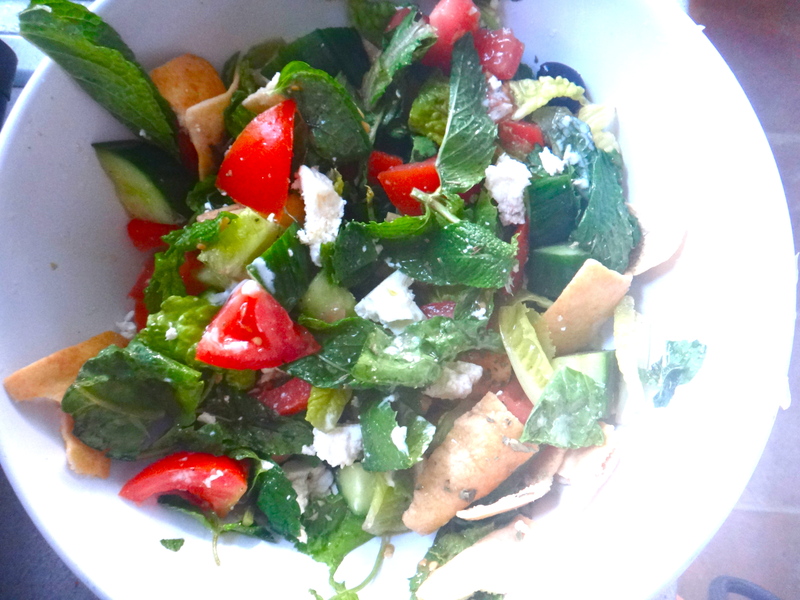 I love fattoush salad which is a Lebanese salad that normally has lettuce (or purslane), cucumber, tomatoes, mint, radish, pita chips and a tangy dressing made of lime, garlic, olive oil and sumac. It sounds terribly simple but its quite addicting, plus a perfect complement to fatty, charred gyros. 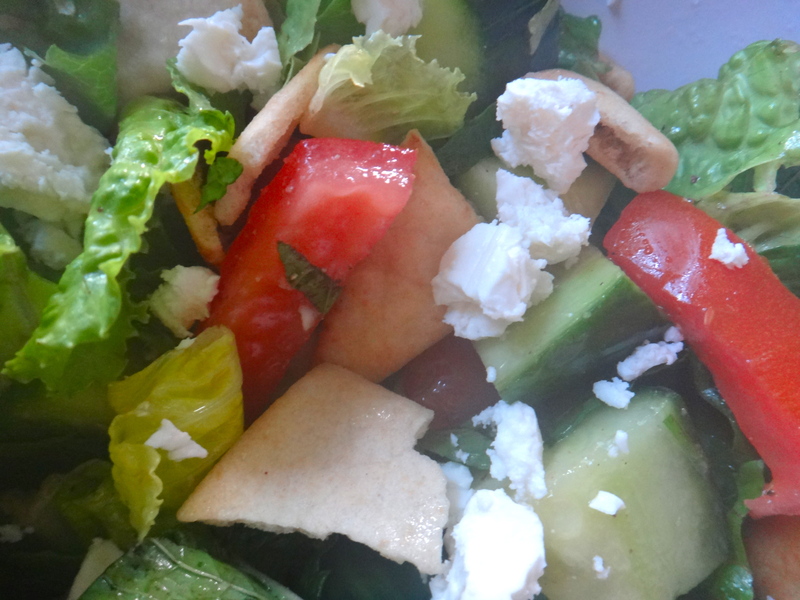 Another classic I think most people are familiar with is greek salad which has tomatoes, cucumbers, black olives, feta, red onions and a dressing of red wine vinegar, oregano and olive oil. So my clever idea that mostly arose out of coincidentally having most of these ingredients at home was to combine both these salads. Unfortunately I did not have sumac lying around so I omitted it but I highly recommend it if you can find it. It’s a reddish tangy spice that really adds a lot to the dressing and almost vaguely tastes like cranberries. 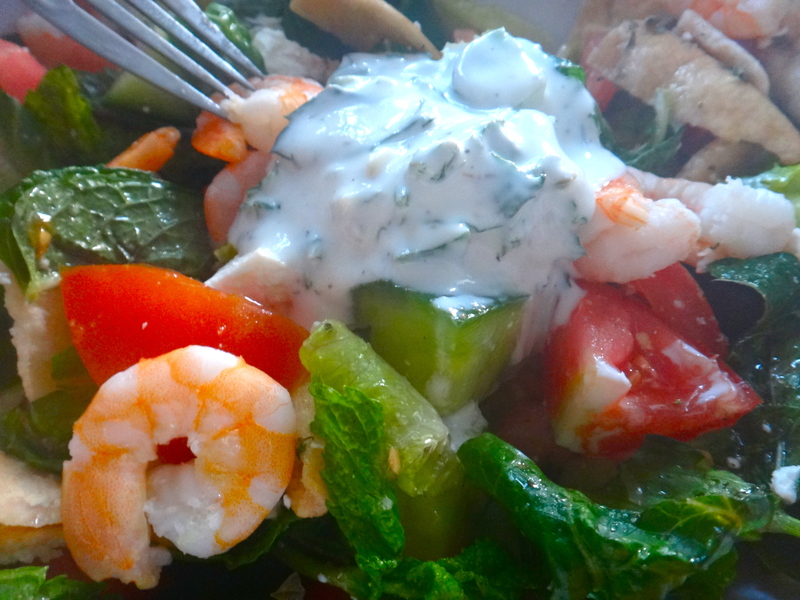 Lastly I added some simply cooked shrimp to the salad and made some amazing tzatziki sauce to go with this salad (and so that I could I dip extra pita chips in). 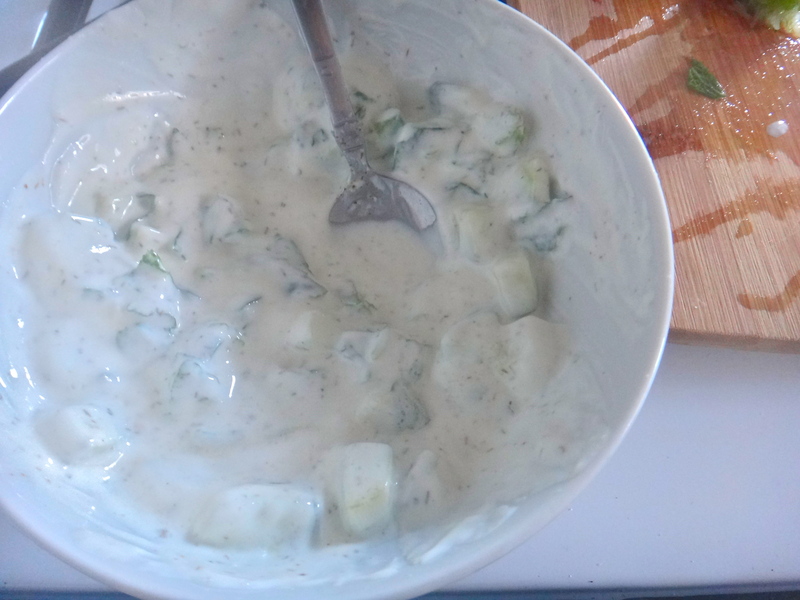 This is an amazing tzatziki sauce recipe that’s pretty healthy to boot. Serves 2 as a meal and 4 as a side. 1. Mix the lime juice, sumac, oregano, red wine vinegar, minced garlic cloves and olive oil into a small bowl. Whisk vigorously until incorporated and set aside. 2. 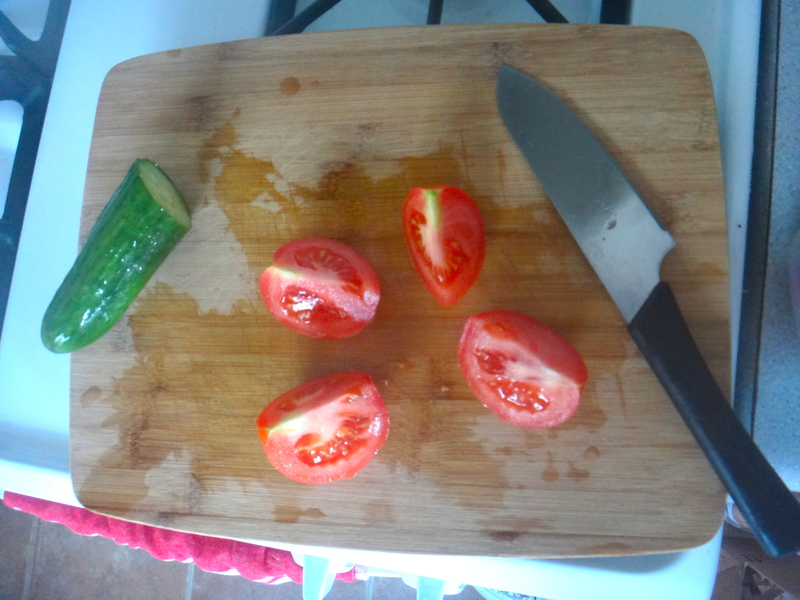 Chop the tomatoes and cucumbers into 1/2 inch pieces. Add to a bowl. 3. 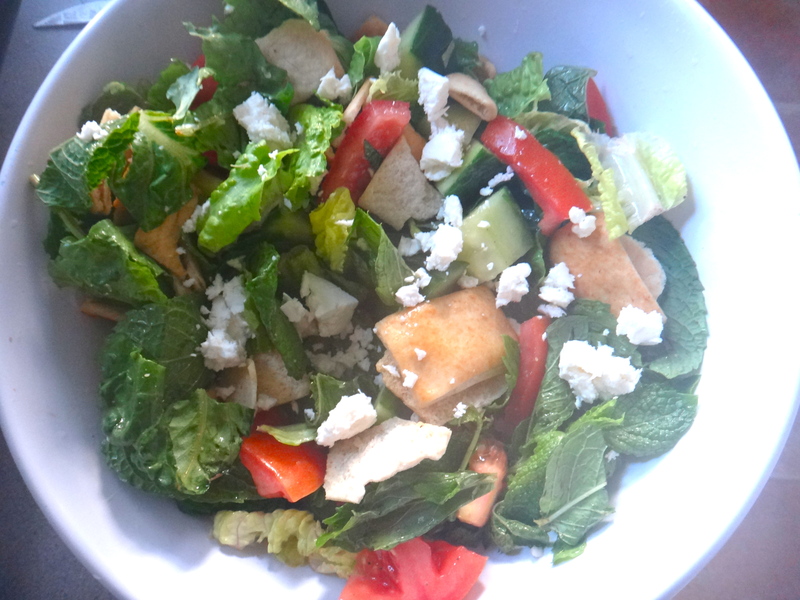 Add in romaine, mint leaves, pita chips, and kalamata olives. 4. Add dressing and toss everything together. 5. Crumble the feta over top. 6. It’s ready! I would add a protein to make this a meal or serve as a side. Now for the tzatziki. 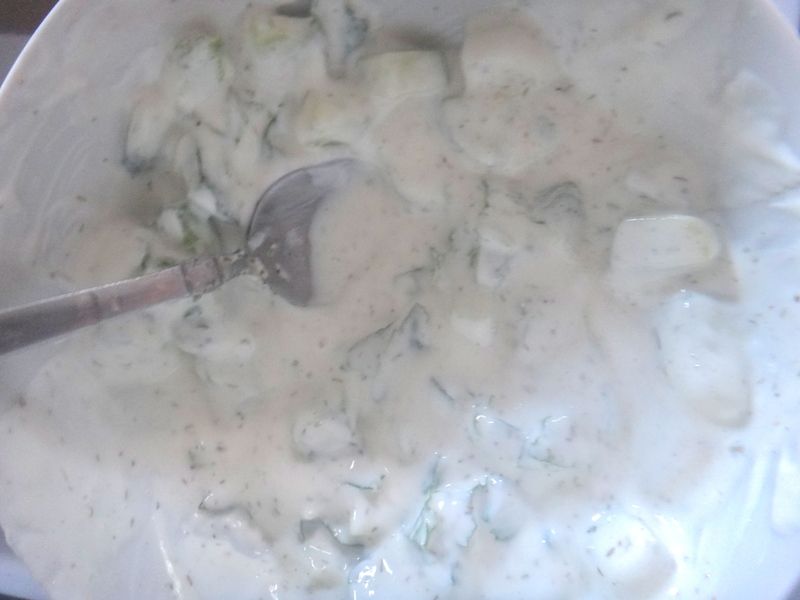 I love having a creamy side to have with the tangy salad but this tzatziki is great for serving alongside kebabs, pita chips, lemon shrimp skewers, you name it. It is especially good as part of a meal when you dollop it over rice. 1. 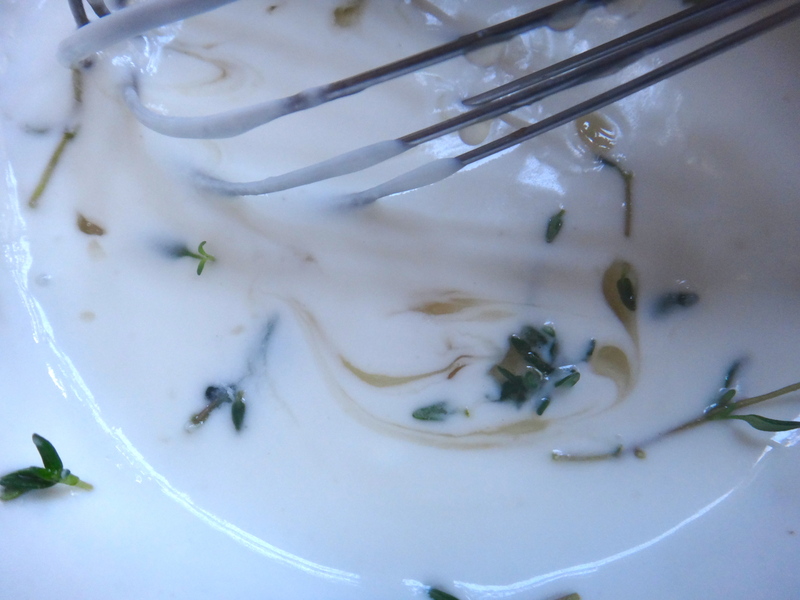 Combine the olive oil, vinegar, salt and pepper in a bowl and whisk together. 2. Add in all the ingredients except for the lemon and whisk together. 3. Add the juice of the lemon, adjusting for how tart you want it. Combine. 4. Drizzle a tiny bit of olive oil over top before serving. So yes. This is how I ate my huge salad. 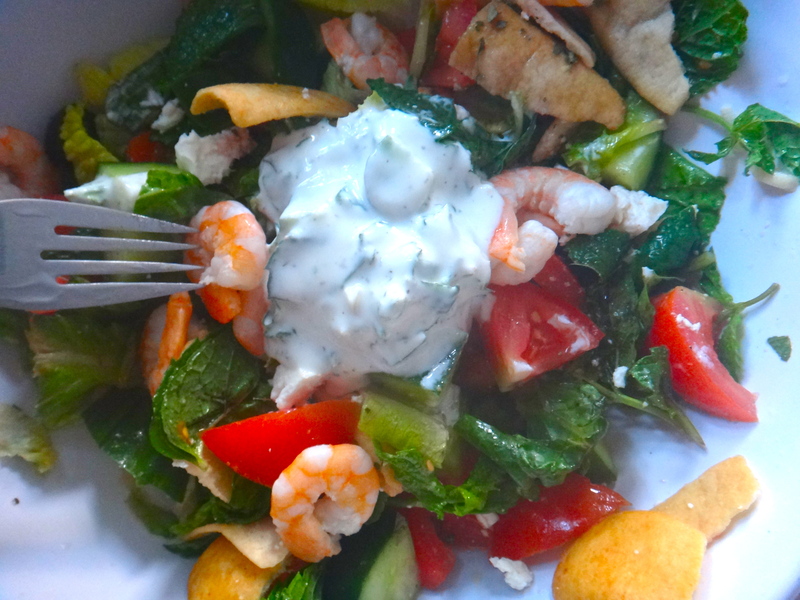 The good thing about this salad is that its quite substantial but because the dressing is fairly healthy you can eat a lot of until you’re quite full. When trying to be healthy its generally good to always control portion size but when you’re eating a big bowl of what mainly consists of cucumbers and tomatoes you can pretty much dismiss portion control and eat until you are pre-tty full. Provided you didn’t go too crazy with the pita chips. This is the final product. I pretty much made this in a large salad serving bowl and then just kind of ate out of the bowl. Even after eating until my post-gym induced ravenous heart’s content I still have a good amount of salad left for the next day. The pita chips do get a tad soggy so if you have extra this is either an excuse for eating all the pita chips and adding more next time or for picking them out when you eat the salad later. 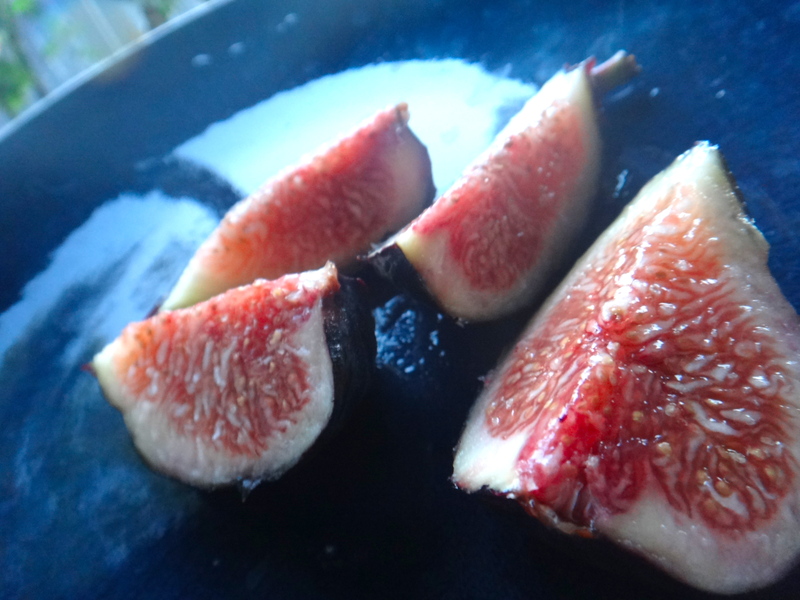 Figs are amazing. 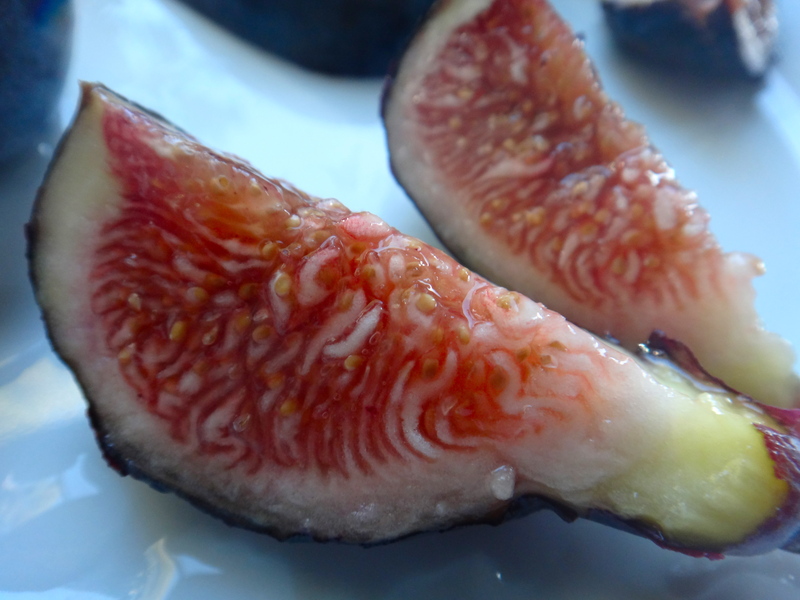 I am aware they are not the most popular fruit and as a kid I tried to pretend I didn’t like it because I thought the interior of the fig looked like “tentacles” but they are delicious. 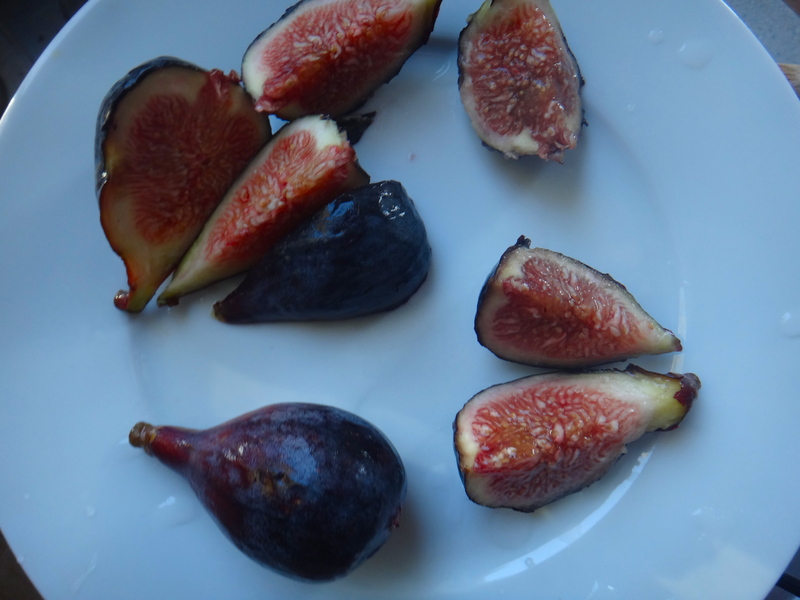 Plump, sweet, and incredibly fragrant I suggest you find yourself some figs before they’re gone! 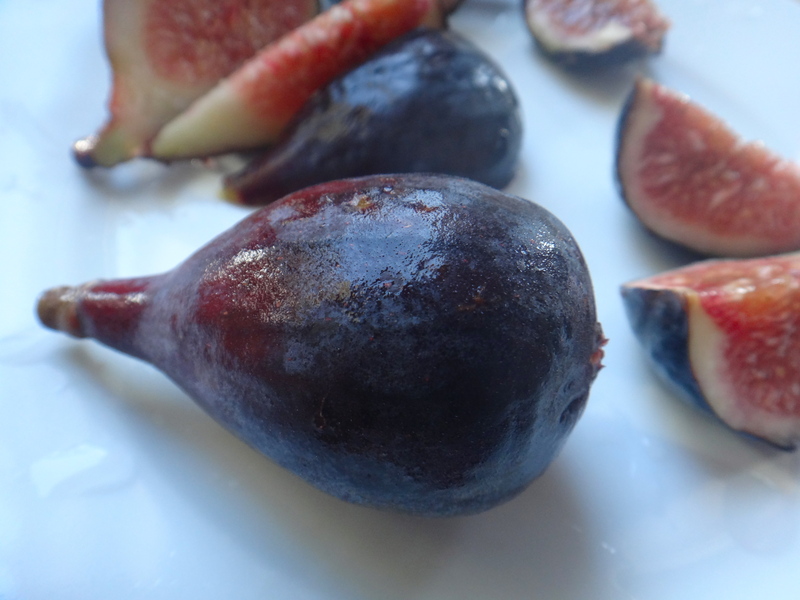 Perhaps the only downside with figs is that they are indeed highly seasonal and a touch on the more expensive side. I have bought figs from Trader Joe’s ($2.99 for a basket not bad at all), from the Little Italy Farmer’s Market ($4.99 for a basket) and Whole Foods ($5.99 for a basket) and sadly despite the TJ’s one being super cheap they were also not quite worth the money as they were still green on the outside and even after ripening were mostly hollow and dry inside. The one’s from the farmer’s market were the best, and I will be picking more up this weekend! 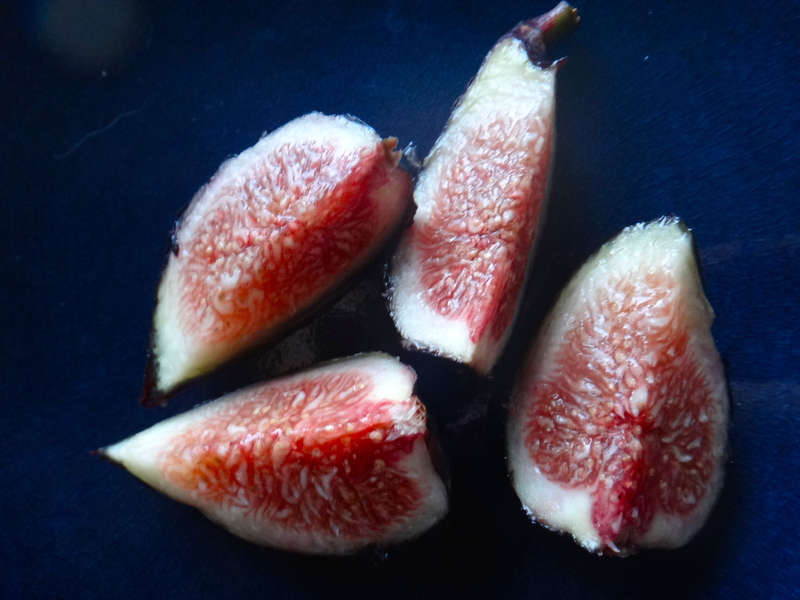 There is not much you need to do to enjoy figs, I find that they’re best when super fresh, it almost seems like a waste to cook them into anything unless they are dry or past their prime. One of my favorite ways to eat them is as a light snack, drizzled with honey and then sprinkled with thyme and good feta or with a dollop of thick greek yogurt if you are not into the salty and sweet thing. And as much as I like them fresh, I perhaps got too excited about figs and having bought some from the farmer’s market and Trader Joe’s I decided to use some of the Trader Joe’s ones to make popsicles. 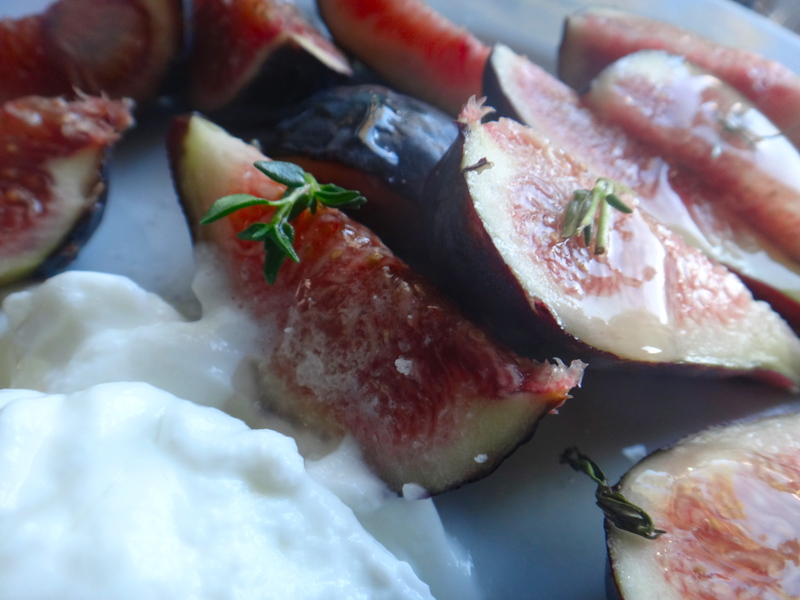 More specifically: fig, greek yogurt, goat cheese, thyme and honey popsicles. 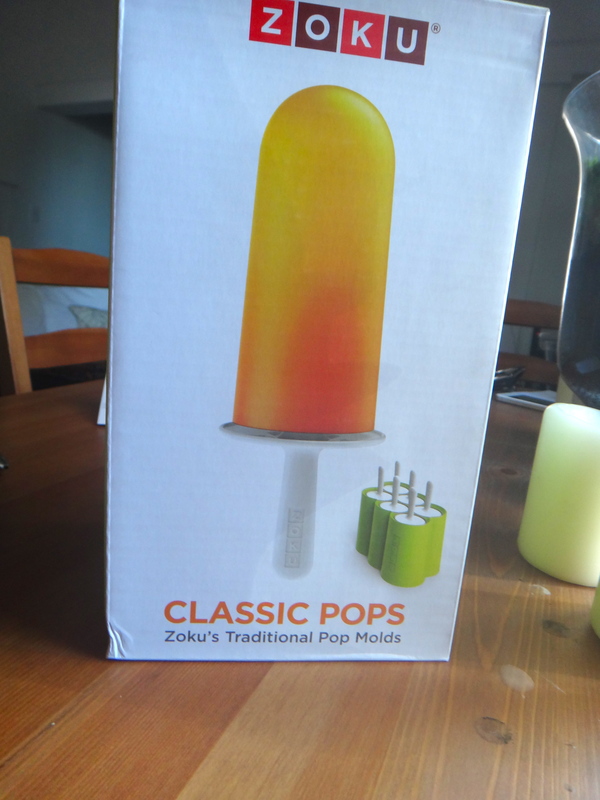 This might have also been influenced by me recently acquiring these nifty little Zoku popsicles molds. Makes 2 popsicles with my molds, to make more double, triple, etc. accordingly. 1. 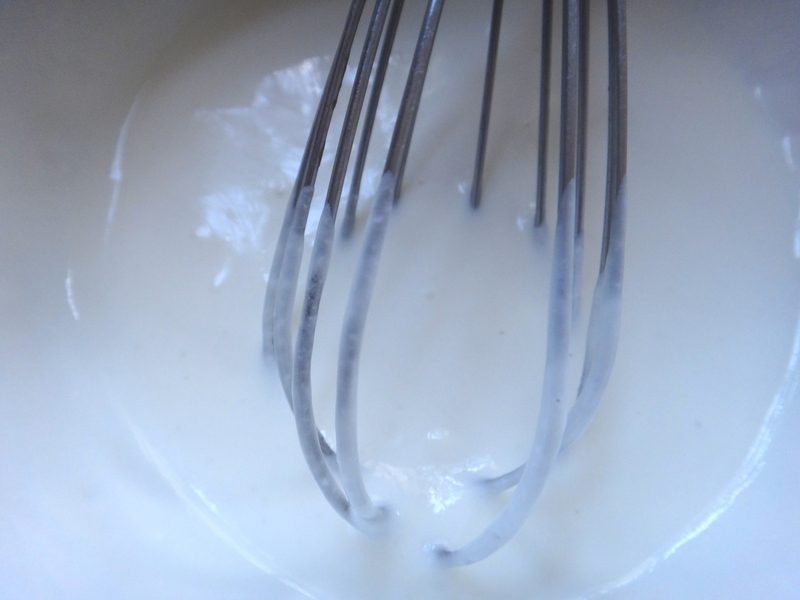 Whisk the greek yogurt, goat cheese and sugar/agave/sweetener together until smooth. 2. 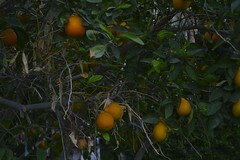 Taste to see if its sweet enough for your liking, keeping in mind we are adding some honey after. Add more if necessary. 3. 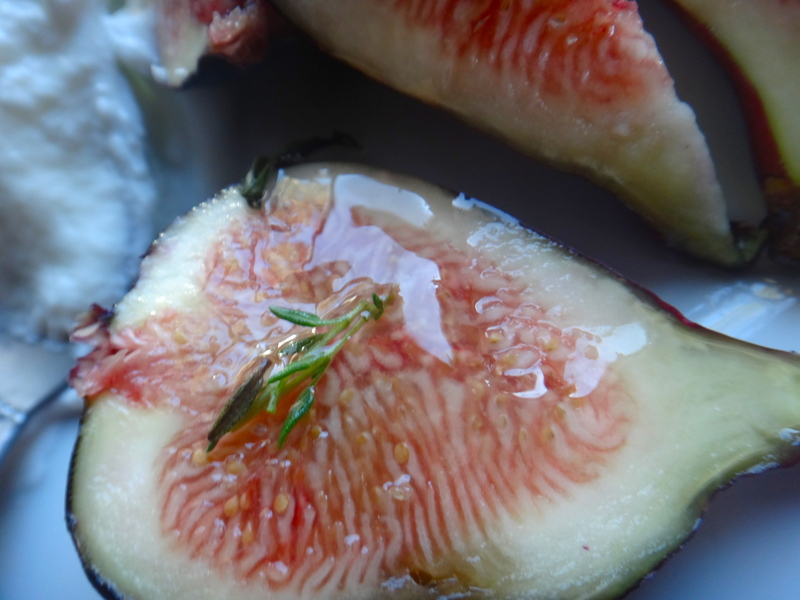 Stir in 2 tablespoons of the honey, thyme leaves, and chopped figs. Beat the figs around with the whisk a little so they break down a little until the whole mixture is the lightest shade of pink. 4. Add the last 2 tablespoons of honey but only mix in slightly so you still have swirls of honey. 5. 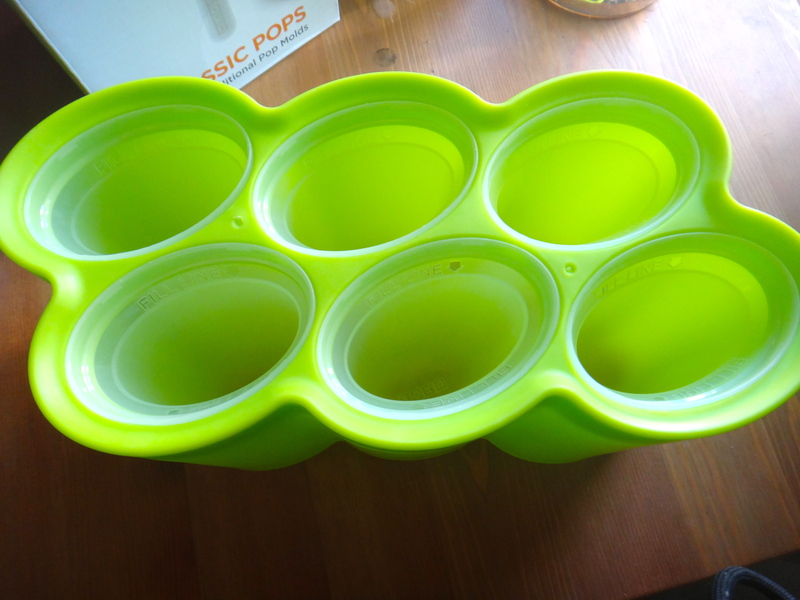 Pour into popsicle molds and let freeze for at least 3 hours or according to popsicle mold instructions. 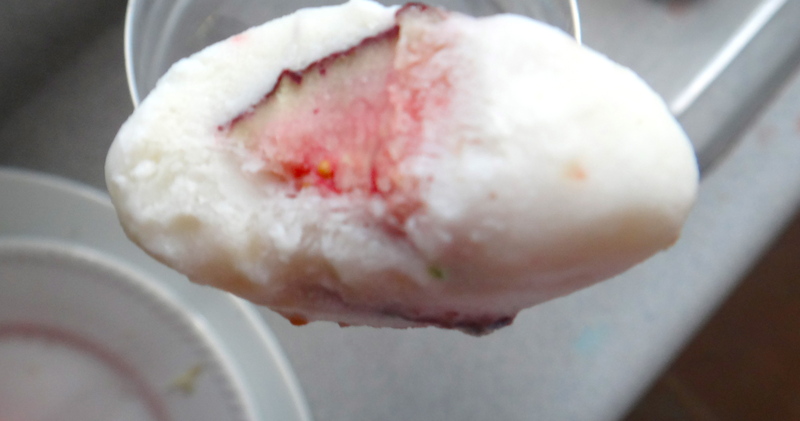 So basically with popsicles or ice cream the more impurities you add to your liquid base the less solid it will be. Adding sugar, fat or alcohol all will make your popsicle softer. For this recipe I used nonfat Greek yogurt but using full fat would give you a creamier popsicle. This is a lovely very grown up popsicle with good tang from the goat cheese, a floral flavor from the honey and figs and lastly a slight herbal earthiness from thyme. I don’t know that kids would enjoy it as much as adults but this is a perfect light dessert to serve after a summer BBQ. – If you don’t like figs other fruits that can be substituted would be strawberries, apricots, grapes, blueberries or peaches. 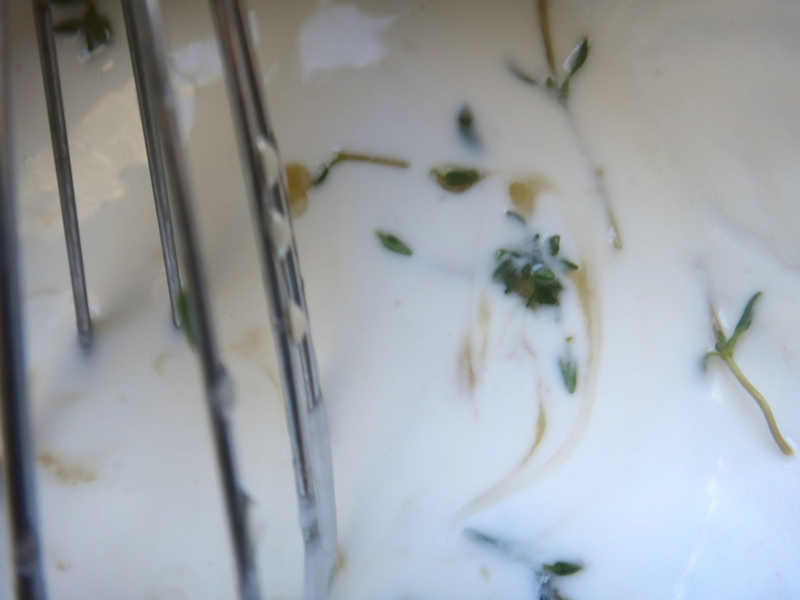 – Thyme and the goat cheese could also be omitted. For the herb component you could also substitute it, some herbs that play nicely with sweeter flavors are rosemary, tarragon, mint, lavender, and basil. 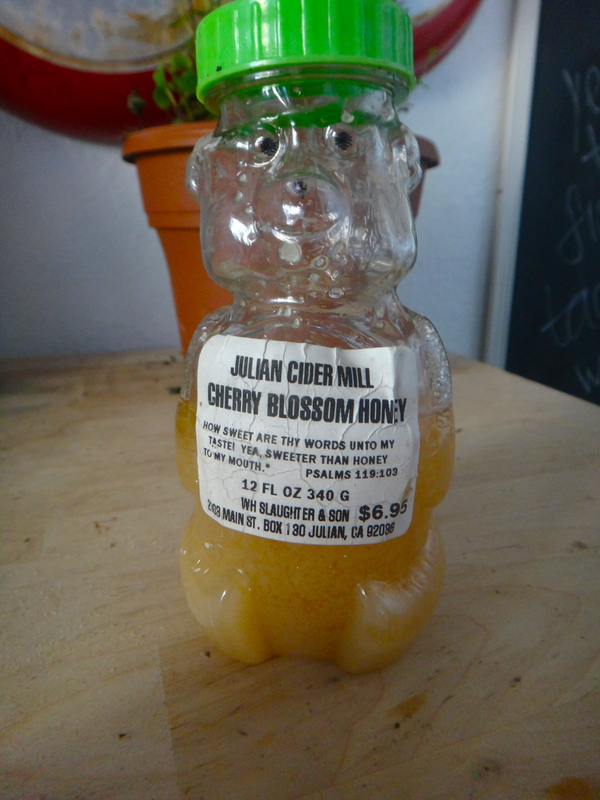 – Different kinds of honey would add different dimensions to the flavor, I used a light cherry blossom honey but buckwheat honey would add a deeper honey flavor that would be lovely with the thyme. 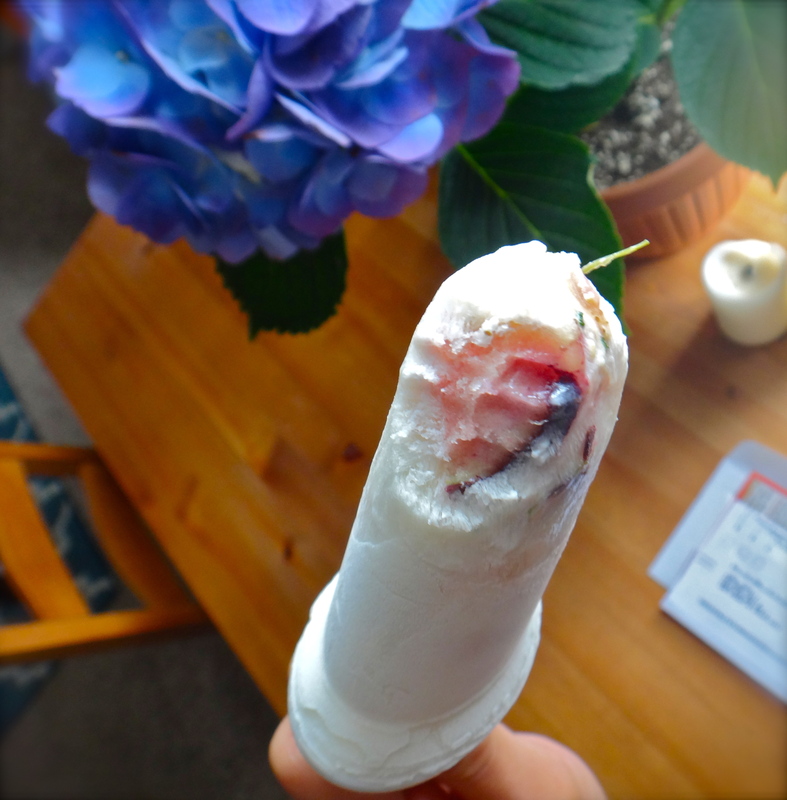 – Lastly, if you want a really creamy popsicle you could always substitute heavy cream for the greek yogurt! But just make sure the cook the cream with the sugar before so that the sugar is properly dissolved. So I’m pretty when people are thinking desserts in San Diego their first thought is Extraordinary Desserts. 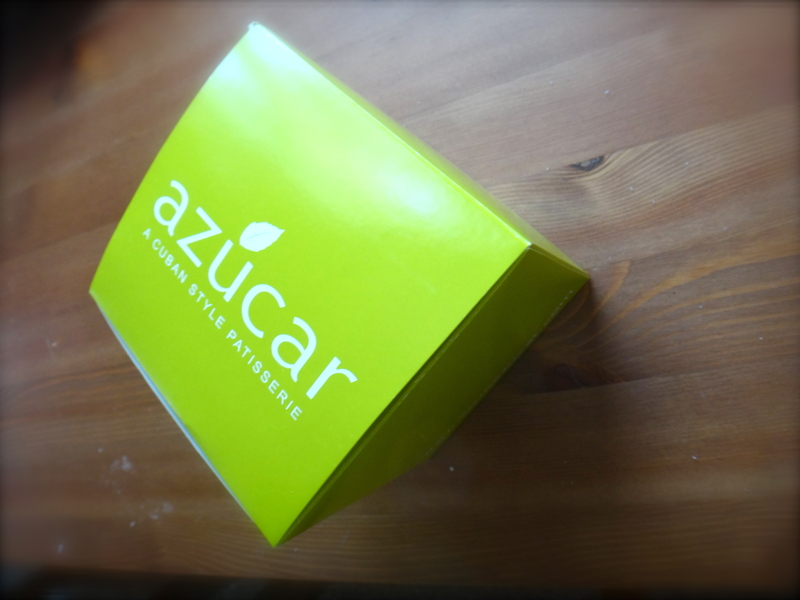 Which is completely understandable and pretty fantastic as far as desserts go, however I invite you to consider Azucar in Ocean Beach as well. 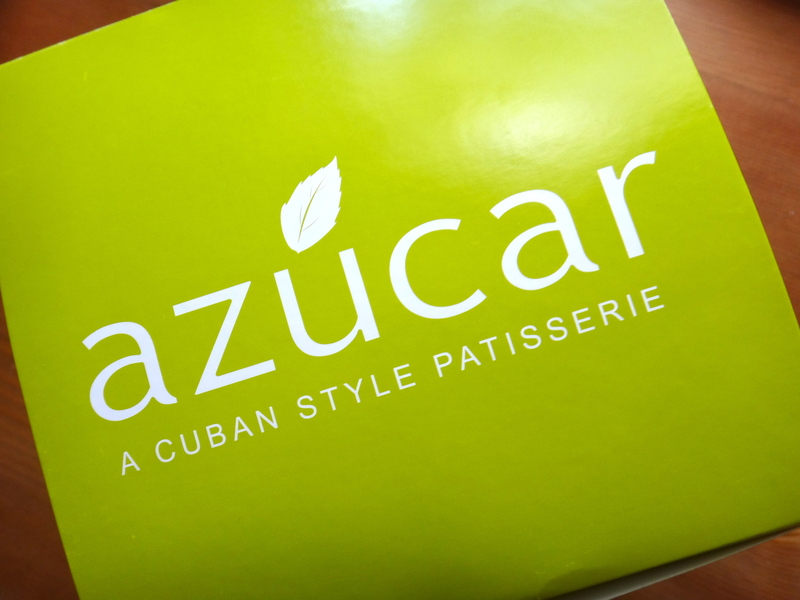 Although it bills itself as a Cuban style bakery, they go beyond that and have fantastic offerings. Its definitely smaller and more casual than Extraordinary Desserts but I think a perfect afternoon would be perusing the antique stores on Newport Av. 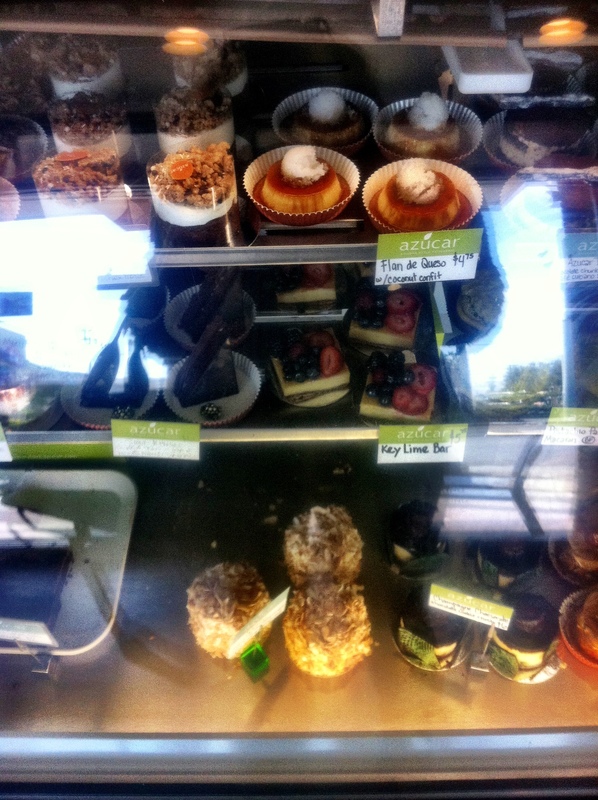 and then stopping and getting some coffee and dessert at Azucar. 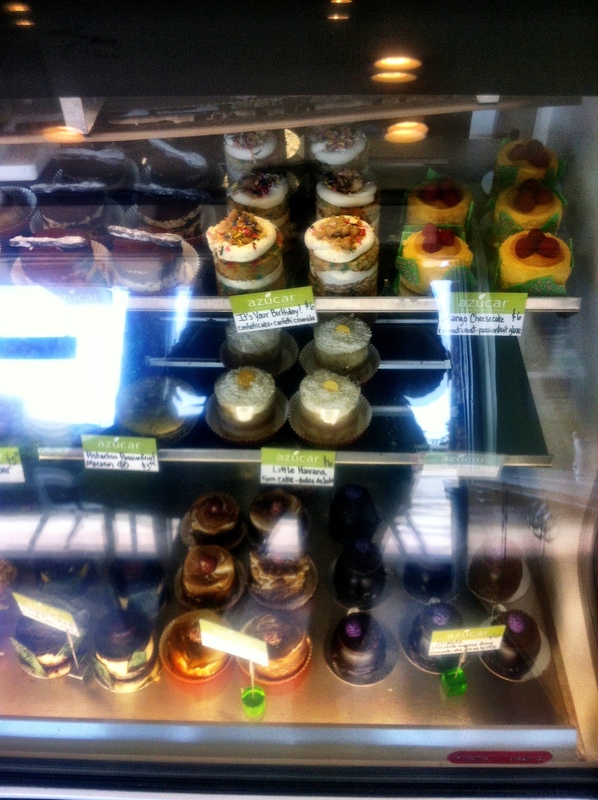 The cakes are mini sized and mini priced (your waistline and wallet will thank you!) but still feel very high-end and complex, with ingredients like passion fruit curd, flambeed pineapple, and champagne infused chocolate. You can also get yummy sandwiches (try the Cuban naturally) as well as amazing coffee. They also do more casual pastries like their flaky pastries with guava or cheese, ham croquettes, cookies, brownies, scones and cupcakes, etc. Personally I prefer their sweet to their savoury. As a disclaimer I will say that in life I also prefer sweet to savoury. As far as their more elaborate little cakes these are an incredibly affordable $6 bucks. One of my favorites is a white cake with passion fruit curd, raspberries, and a marshmallow toasted top. 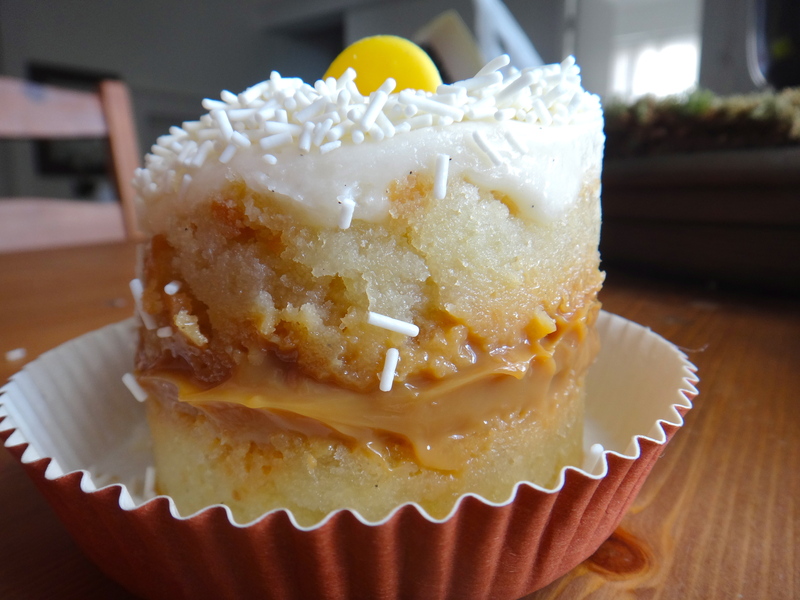 Next on my to try list is one that had rum soaked cake layered with coconut cream and flambeed pineapple. And their birthday cake is also inspired by the Momofuku birthday cake which would please anyone with a super sweet tooth. However, what I actually got this time was a white layer cake with dulce de leche filling and a vanilla frosting with sprinkles. Behold. It WAS delicious. A little too sweet with the frosting but I tend to not be a big frosting person anyways. 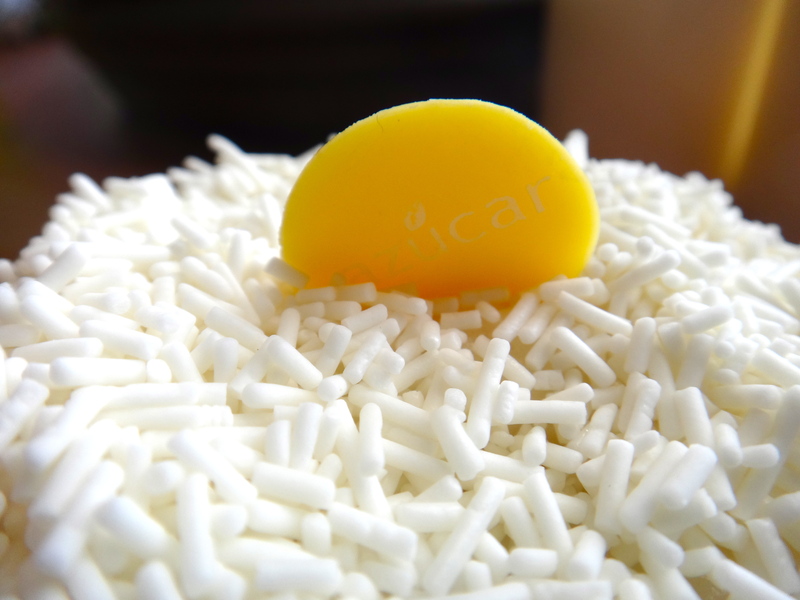 The cake is so moist and flecked with little vanilla beans (play find the specks on the first image of this post!). 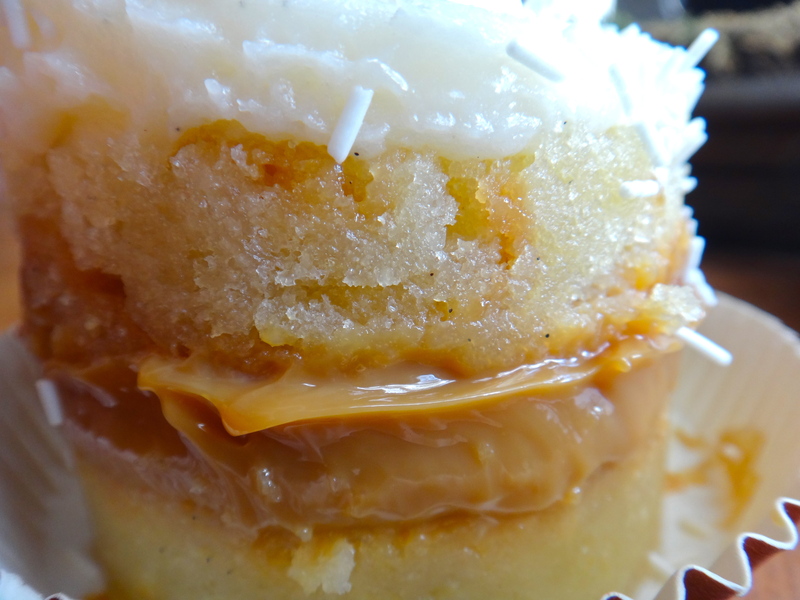 It pairs incredibly well with dulce de leche because really what doesn’t pair well with dulce de leche. The other item I tried was their mojito cookie. This was awesome. 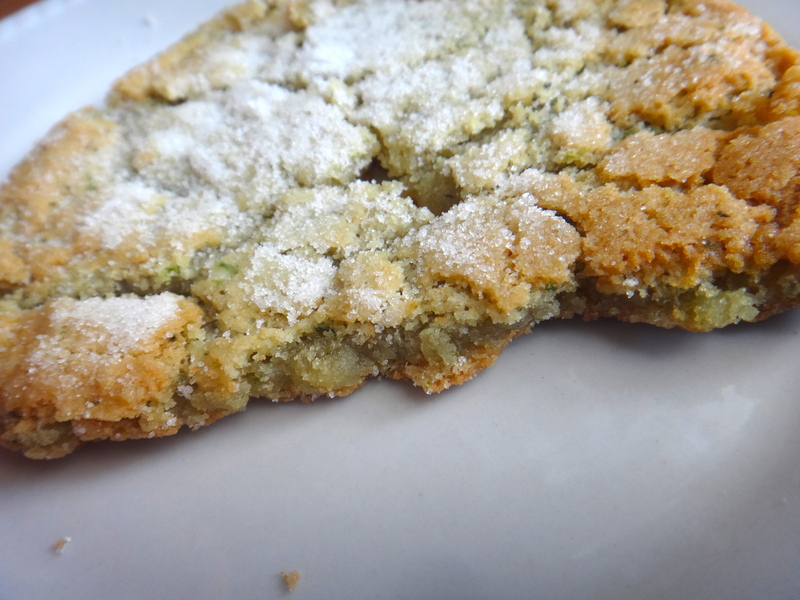 The cookie is thin but chewy and a light green inside, topped with granulated sugar. It really does taste like a mojito sans the alcohol component. 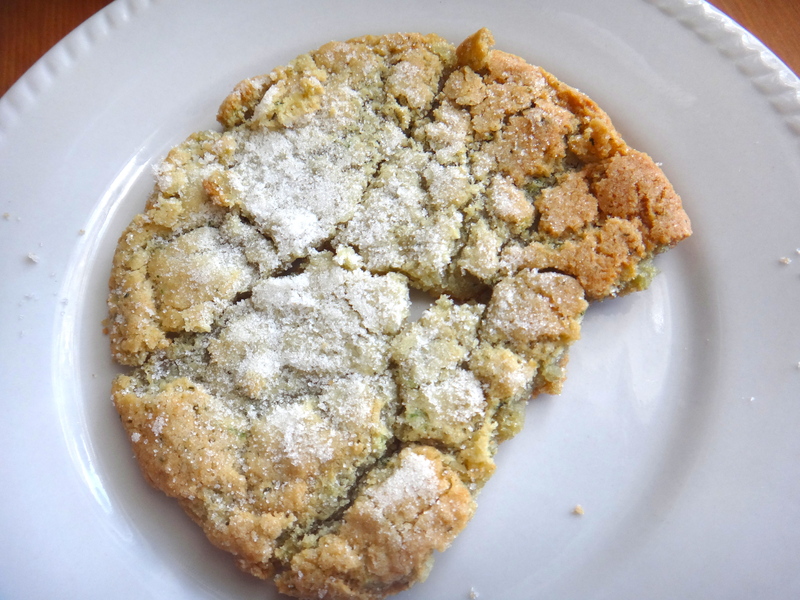 But the fresh mint and lime flavor with the texture from the granulated sugar really makes this cookie. And yes I had a bite on the way home before I was able to take a picture of it. Life happens. 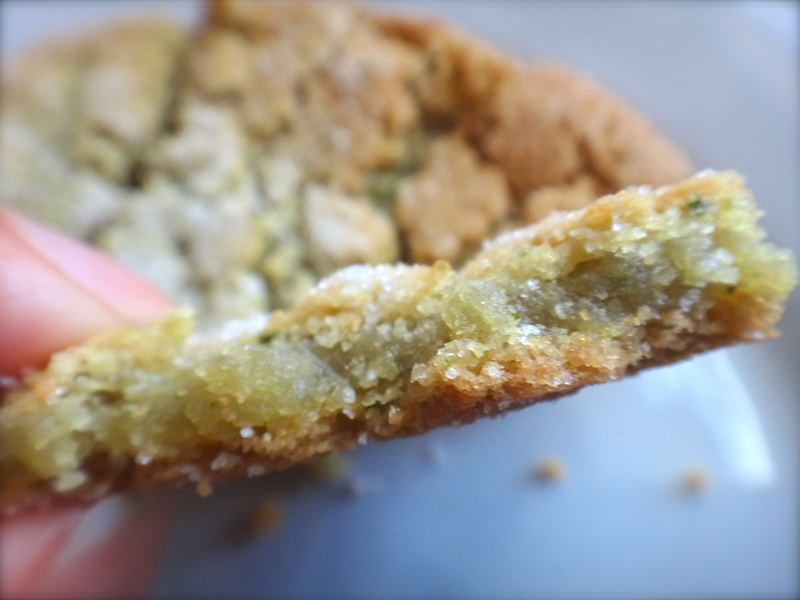 Mojito Cookie – So green! After being quite smitten with Polite Provisions the first time around, we decided to revisit the place during the afternoon to see what it’s like a little earlier in the day. It was definitely less crowded on a Thursday afternoon compared to a weekend night which is when we previously attended. We were able to sit at a table and it was a more casual vibe with most people ordering food from neighboring Soda & Swine next door. The cocktail I ordered was the Ocean Side. 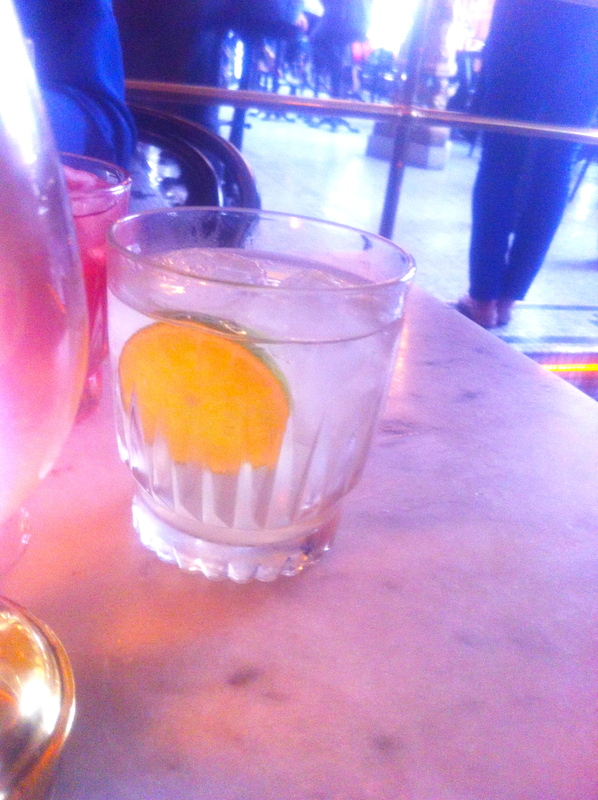 This came with London dry gin, fresh lime, mint, sea salt and celery bitters. I really, really liked this drink. It’s refreshing, not cloyingly sweet, and herbal as well as sweet and savoury at the same time with the sea salt and celery bitters. 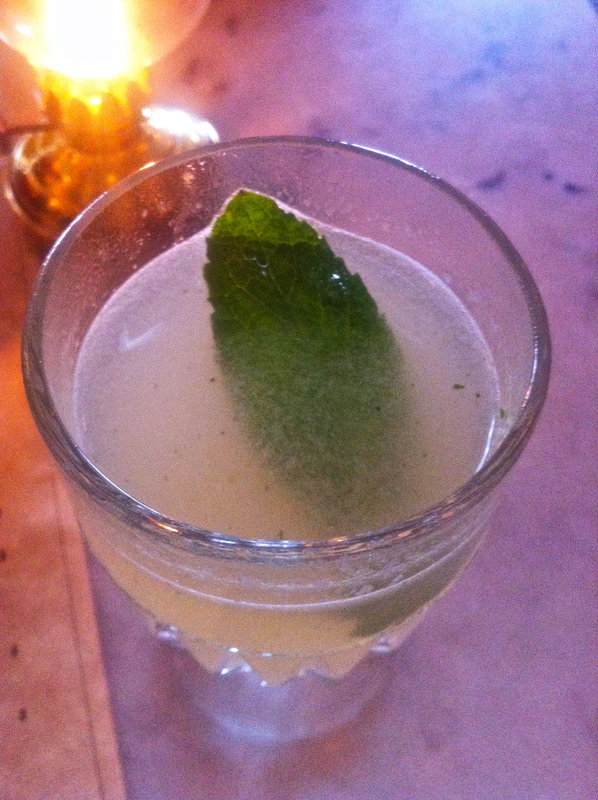 The celery flavour is noticeable but subtle, it played really well with the mint and lime. I’d reckon if you like gin and tonics and you like Bloody Mary’s you would like this guy. One of the other drinks we ordered at our table was the Uncle Jalapeno, with Blanco tequila, jalapeno, and T-Bone’s pineapple soda. I love spicy flavors in drinks like the habanero infused beer Ballast Point does or the jalapeno infused drink at Whisknladle (cannot remember its name right now even though I always order it!). I am not someone who can handle suuuper spicy food so don’t worry if you are wary of that, these are not meant to burn your palate, the peppers just add the slightest zing and more of their flavor than just blunt spice. The pineapple soda tastes like fresh pineapple and complemented the jalapeno and tequila flavors really well, without being too sweet. If you like those Mexican fruit cups with the spices and little limes on them you will love this. The last drink we had was the Kentucky Buck. This drink was a little sweeter and fruitier but not anything excessive. It has bourbon, fresh lemon, strawberry and ginger beer. Ok so the best way I can summarize this drink is that it tasted EXACTLY like strawberry fruit roll-ups. IT WAS AWESOME. And other people at our table agreed. Not very bourbon forward and very drinkable. If you’re not a fan of spirit-forward drinks but like fruit roll-ups (and who doesn’t?) you will like this drink. We’ve been hearing a lot about Polite Provisions, which is from the same owner’s as Noble Experiment and is supposed to have quite the ambitious cocktail program. Polite Provisions is in University Heights, on the corner of 30th and Adams. Its definitely a little more bare bones than the area around Adams/Park Ave, which has lot of restaurants and shops, but you can tell there’s trendy new places popping up around it (like its brother meatball shop restaurant Soda & Swine which is right next door and Jayne’s Gastropub which is around the corner). The decor of the place is awesome. 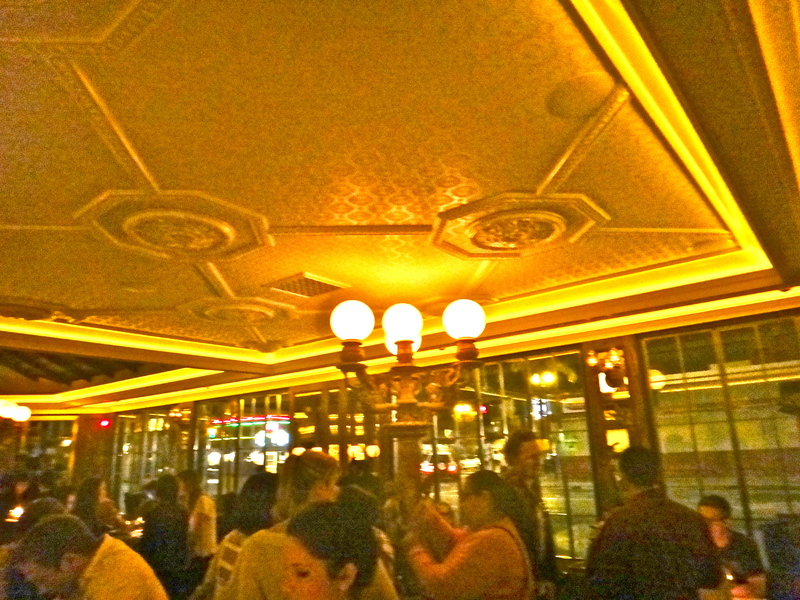 Its very Art Deco 1920s style, with old school street lamps and an engraved ceiling. 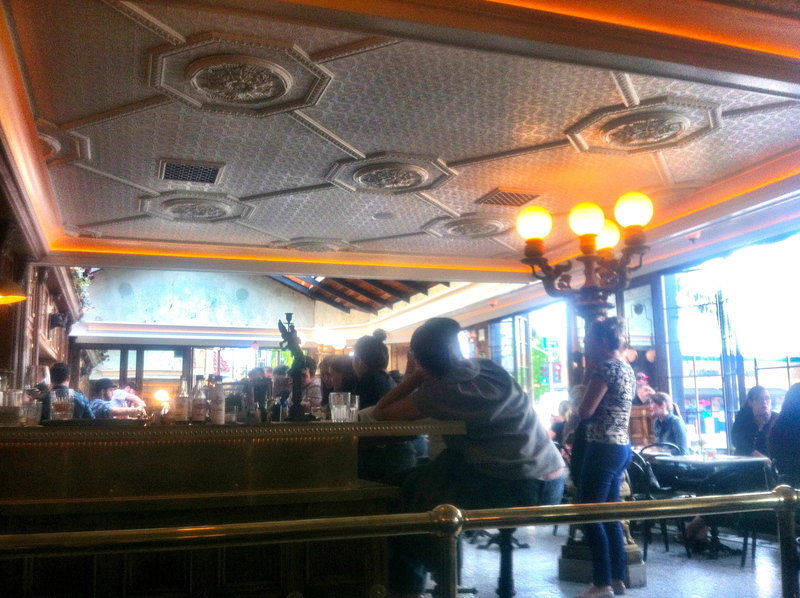 The bar is very long and there are extra tables and seating. Although it was Saturday around 8:30 pm and all the seating was taken the bar was not super packed and there was standing room next to the bar and enough bartenders that you could easily order and they would check up on you. No need to insert yourself in between two strangers and hope to catch a glance of one of the bartenders whilst holding your credit card out in front of you to order a drink. 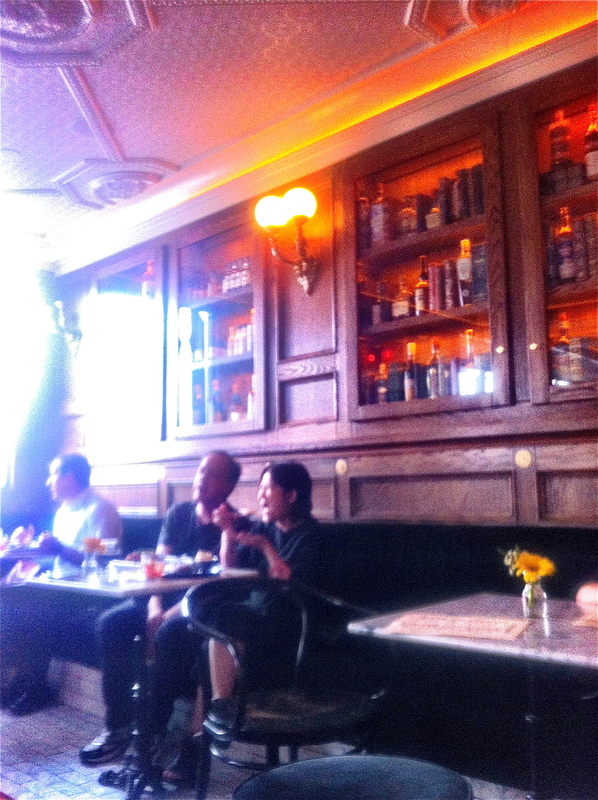 Although Polite Provisions only serves drinks you can order food from Soda & Swine next door and they wil bring over. 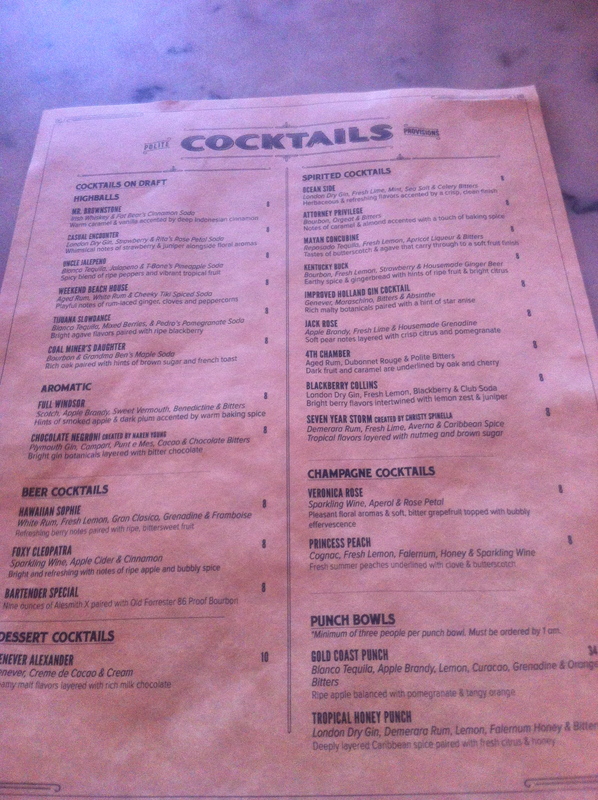 Their drink menu is extensive and covers a lot of different tastes. They have dessert cocktails (with chocolate/cream/maple syrup! ), beer cocktails, cocktails on draft, lighter champagne based cocktails and more spirit forward fare such as negronis. They also have punch bowls (a good deal if you came with a larger group), wine, and because this is San Diego naturally they have a good selection of craft beer. Maybe more unexpectedly they also have a good selection of virgin soda cocktails so your designated driver doesn’t have to sadly sip on a Diet Coke while everyone else samples the good stuff. 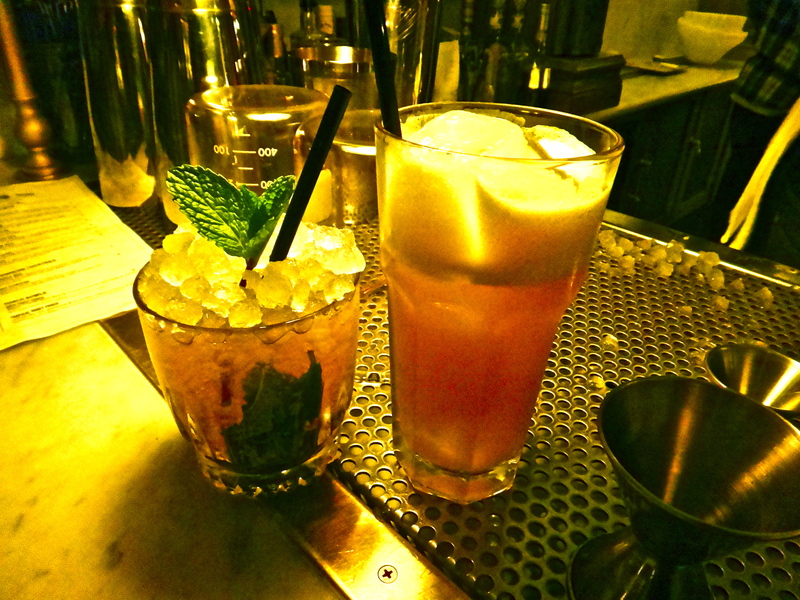 First we ordered the Misty Mountain Buck (rye whiskey, fresh lime juice, organic pineapple, housemade, ginger beer & bitters) and the Honey Stone Julep (bourbon, organic mint, apricot liqueur & honey). Both were excellent, especially for $8 dollars. The Misty Mountain Buck was very ginger-y and very pineapple-y but well balanced and refreshing. The Honey Stone Julep was more spirit-forward but also sweet and the apricot and honey flavors complemented the mint really well. You could taste that they use very fresh, top-notch ingredients. A lot of their ingredients are house made too which shows how much they care about the final product. Our next drinks were the Chocolate Negroni (gin, Campari, Punt e Mes vermouth, creme de cacao and chocolate bitters) and the Coal Miner’s Daughter (a bourbon based drink we don’t recall the other ingredients of and that is not on their menu online…). The Negroni was interesting and definitely had chocolate-y notes which balanced out the Campari and the orange peel that is traditionally served with negronis. Don’t know if we would order it again though. 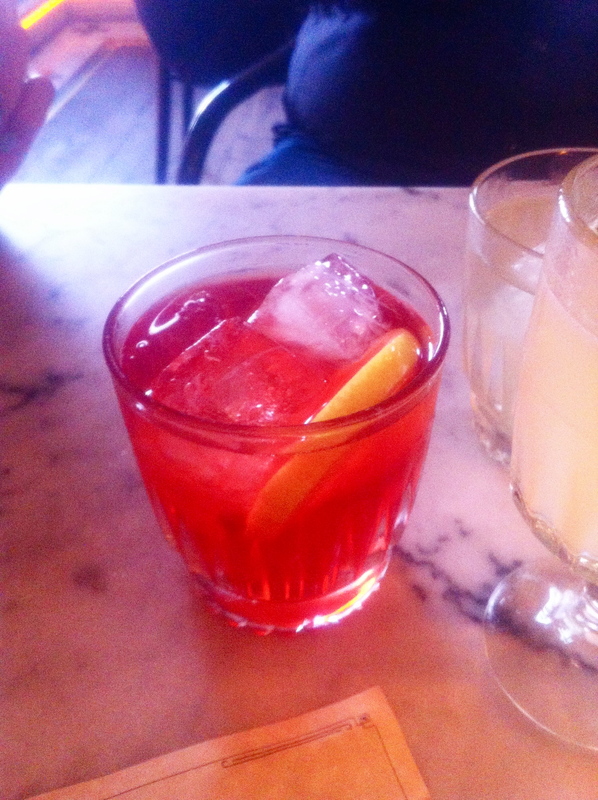 The Coal Miner’s Daughter was good as well, this was a very spirit-forward drink. We liked our first cocktails better but these were definitely not too shabby either. Overall the price, the atmosphere, and the drinks were all excellent. 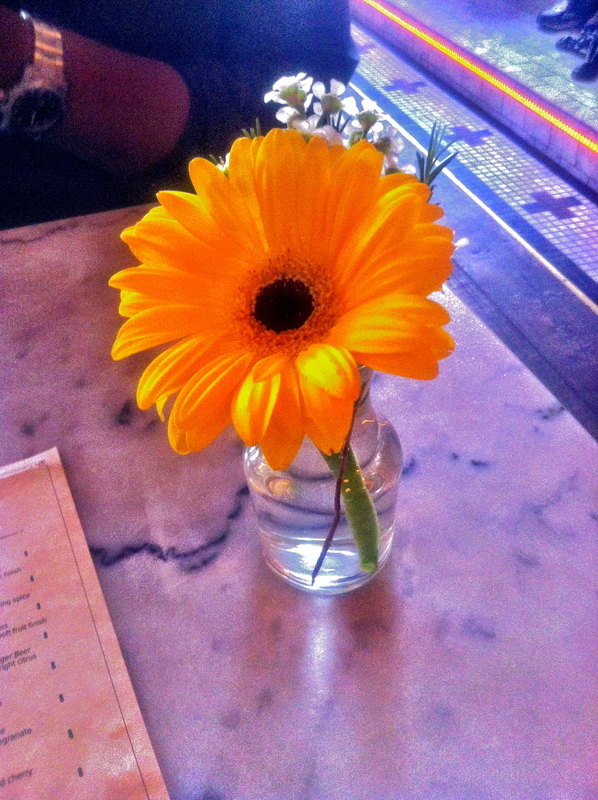 We will definitely be returning to Polite Provisions.